"Do you fancy a railtour?" Steve asked, around the middle of February "Picks up at Shrewsbury and Telford, covers some interesting track on the Southern". "The Exhibitionist", running on 23rd March, would be originating at Chester, picking up at stations to Wolverhampton, then travelling to Kensington Olympia (for the Ideal Homes exhibition), before heading for Alton and a trip (optional, class 27 diesel hauled) on the Mid-Hants Railway. We booked. It was a little difficult to be sure who was running the train - a bit like railways generally in Britain today. 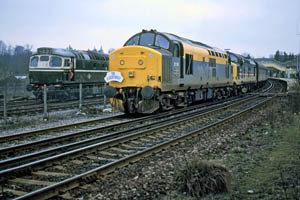 The tour leaflet indicated "Shropshire Rail" and "The Class 37 Group". The ticket - a scissor-cut job on yellow photocopier paper - stated that Shrewsbury and Atcham Liberal Democrats "Campaigning for the railways" were sponsors. I met the train at Telford Central - Steve had joined the train at Gobowen, and Dave at Shrewsbury. The advertised time was 0750; in fact it was a few minutes late, though this was soon made up, and with one notable exception, we ran to time or early all day. Haulage for the day would be two class 37s - 37 211 in "Dutch" livery, and 37 426, looking rather tatty in its Inter-City livery. Formerly Y Lein Fach / Vale of Rheidol, the latter carried a painted-on nameplate Mt Vesuvius. I’m not quite sure what this was intended to imply - whatever it was, the two locos performed very satisfactorily. Next and last stop for picking up was Wolverhampton - the route now followed (good guess) was via Bescot direct to Stechford, thus avoiding New Street - always a wise move. We hurried on down the main line, through Coventry to Rugby, where we took the Northampton loop. The reason for this was not made clear, but may have had something to do with the engineering work where we rejoined the main line at Hanslope Junction. On down the LNWR main line we ran, until eventually we came to a stand at Wembley Central for a crew change. Things began to get interesting now. Soon after leaving Wembley we passed the huge complex of Willesden, with much new work evident - a major new facility for the Post Office in particular, which should ensure the use of rail transport for some time to come. Halfway through Willesden, we dropped down from the east side of the main line, to burrow underneath and emerge on the west, ready for West London Junction, where the train took the route via Mitre Bridge Junction to Kensington. My first sighting of a Eurostar set was to follow as we passed North Pole depot - very impressive too! A fair number of people left the train at Kensington, including most of the ladies who had brightened up the train (usually these trips are 99% male affairs). We had time here for a leg stretch on the platform, and to see the underground shuttle trains come and go to and from the exhibition itself at Earl’s Court. Itinerary leaflets produced for railtour participants vary enormously. Many are very comprehensive - few societies could hope to surpass the efforts of the Branch Line Society, for example. This one was particularly interesting for its (Freudian?) spelling errors. Apparently, after Clapham Junction, we were to "bare left". Not forgetting the Mid-Hants Railway’s "knickname" of The Alps. We did bear left at Clapham - further left than we had expected, for rather than heading direct for Wimbledon, we took the former LB&SC line to Streatham, before looping back to the LSWR. I suspect this could be explained by our route into Clapham Junction, the burrowing line from Kensington. We were a few minutes early at Wimbledon, and had time to watch the traffic - and what traffic! Sometimes, living in Shropshire, it is difficult to comprehend the number of trains on the Southern. It seemed as though there was something arriving, departing or passing through more or less continually. Departure time came - and we didn’t. After a few minutes, the rumours began to spread - "the leading loco has a miniature snowplough, and it keeps shorting the third rail and blowing all the circuit breakers for the 750v". We never discovered the truth, though after standing for about 20 minutes we eventually left, snowplough and all. We made steady progress now down the LSWR main line (this trip was nearly an all-western affair - GWR, LNWR and LSWR), through the barren heathlands of Surrey, until we took the Alton route at Pirbright Junction. Shortly after Farnham’s now disused EMU depot, the line is singled, and on arriving at Bentley, the penultimate station on the route, we had to stand and wait for an eastbound EMU, so that we were getting on for 30 minutes late when we arrived at Alton. The diesel-hauled special was an extra, slotted into the normal Mid-Hants service. "I wonder what’s on the service trains" mused Steve, as we tucked into an excellent meal of pan-fried hake and chips, washed down by some equally pleasant Ushers’ bitter. If the hostelry we found is anything to go by (sorry, I’ve forgotten its name), Alton could be worth a return visit. The return journey was reasonably interesting - instead of the outward route, our train followed the slightly longer course from Ash Vale, via Ascot, Twickenham and Putney, back to Clapham. Nearer home, we stayed on the main line instead of travelling through Northampton, before retracing our steps through the West Midlands and home, arriving at Telford Central more or less on time at about 8.05pm. It had been a little while since our last railtour - in fact, it had been my first outing on the partially privatised railway, I realised. Overall an excellent outing for a reasonable fare (£30) - well done, whoever it was - how about another?